The foliage of most plants makes various shades of green dominant in the garden. Because red and green are contrasting colors, playing one against the other will make each seem stronger. Red blooms against green-leaved shrubs are eye-catching. Some shrubs also have red foliage from spring to fall. Warm-colored red shrubs in small numbers draw attention to a particular part of your garden, says University of Vermont Extension Professor Dr. Leonard Perry. Red buckeye (Aesculus pavia) is a clumping shrub hardy to minus 30° Fahrenheit. It normally stands between 12 and 15 feet high and wide, and grows wild on woodland slopes and stream banks through much of North America. The plant's glossy, deep green leaves are at their best before August. They make an attractive backdrop for the upright, 4- to 10-inch clusters of red, tube-shaped flowers. Red buckeye's blooms will bring hummingbirds to your garden. The plants produce seeds encased in light brown husks. They ripen in the fall, and are toxic if ingested. Plant this deciduous shrub in full sun to partial shade and moist, rich, well-drained soil. Use it as a hedge or screen, recommends the Missouri Botanical Garden. The leaves suffer in dry weather and appreciate afternoon shade where the summers are hot. Rose "Noare" Red Flower Carpet (Rosa "Noare") is a trailing ground cover shrub rose hardy to minus 20° F. It stands 1 to 2 feet high and spreads up to 3 feet, and has glossy green leaves. Its clusters of deep red roses bloom from May until the first frost. Largely disease-resistant, "Noare" tolerates a variety of pests, including aphids, spider mites, thrips and scale. Plant this rose shrub as a ground cover--two or three plants per square yard--foundation planting or in containers, advises the Missouri Botanical Garden. It performs best in full sun with good air circulation. Use well-drained, averagely moist acidic (pH below 7.0) loam. Water in the morning without wetting the leaves, and provide hot-weather mulch. 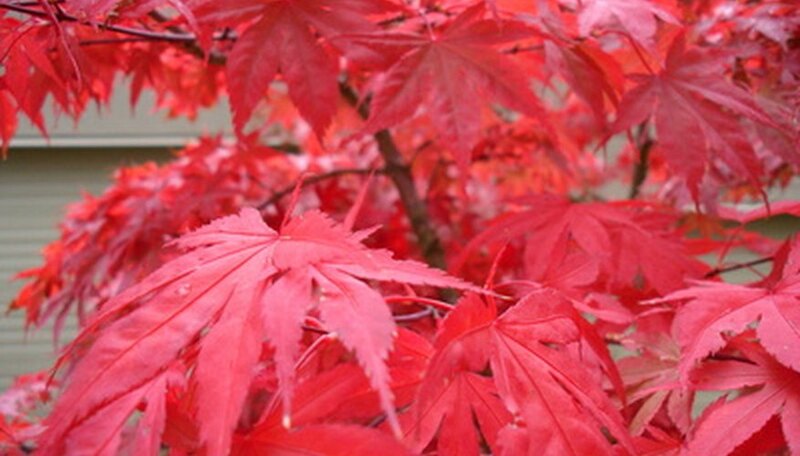 Japanese maple "Red Select" (Acer palmatum) is a small, 6- to 10-foot high deciduous shrub with lacy, colorful foliage. Red when new, the lobed, 6-inch leaves become reddish purple over the summer and brilliant crimson in fall. Hardy to minus 20° F, "Red Select" also has inconspicuous red flowers in early spring. It's relatively resistant to most insects and diseases, but may suffer from mites. Other potential problems include canker, wilt, aphids and scale. This cascading shrub is an attractive accent plant near patios or ponds, according to the Missouri Botanical Garden. Plant it in sun to partial shade and moist, rich, acidic sandy loam. Provide protection from strong winds and give it afternoon shade in hot summer areas. Avoid summer pruning. What are the Best Shrubs for the Northwest?